It takes place between A New Hope and The Empire Strikes Back. In effect the first original full-length expanded universe works and was published shortly after the release of the original movie. The plot features only Luke, Leia and Vader as they jostle on the planet Mimban to find the Kaiburr crystal, a device which allowed the user to greatly increase their Force powers. The book was commissioned by George Lucas as a being the basis for a potential sequel to Star Wars. 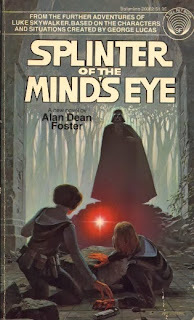 Alan Dean Foster was writing the novelisation of Star Wars and also SOTME as second book. He was as simply instructed by Lucas to write the book based off some ideas and film treatments that George threw at him. According to Foster, Lucas's only request upon inspecting the first draft was the deletion of a space dogfight featuring Luke and Leia before they crash-landed on Mimban, which would have been effects-heavy and thus expensive to put to film. The reality is that when Star Wars 'went global' Lucas changed story direction and the film sequel script was first drafted by Leigh Bracket, which after her death from cancer, Lucas refined further with help from Lawrence Kasdan. In terms of the old canon timeline, Empire made no reference to the book's plot. Technically it can serve as canon and perhaps more so than recent efforts in the expanded Star Wars universe. That said, the ending features Luke cutting off Vader's arm and this is repeated in Empire. So it's probably best just to count this story as a good yarn about Star Wars and leave the real canon to the films and the novels that came much later that attempted to do real justice to the lore that developed. In the new Star Wars canon which rebooted somewhat with The Force Awakens, the plant Mimban is featured in the Han Solo movie where we see Han hanging out dressed as a Mud Stormtrooper. There are new rules about canon and this book no longer counts. SOTME is regarded by many Star Wars fans as a classic Star Wars story and it is still a popular read. Buy Splinter of the Mind’s Eye from Amazon. Lordy I loved this book when it came out, there wasn't so much Star Wars material around. I read it so many times! Yeah, it's a classic read! I just finished this book and can only say I am BEYOND glad it is NOT canon. Also, to the writer of this article... either you made a simple (understandable and forgivable) switch of characters in the end paragraph: Luke cutting off Vader's arm; or you never watched empire more than once... BUT to say that this is repeated in Empire is incredibly wrong. Luke loses a hand in the fight with Vader, but there is NO - or nearly no - damage done to Vader, let alone an amputation... for shame. Here's the great thing about this book, it's a top notch story by a top notch author that definitely understood the Star Wars universe, and it's a stand alone that comes in at the standard '70 paperback length of about 250 pages instead of the three volume 1,200 page formula that we seem to be forced to commit to nowadays.